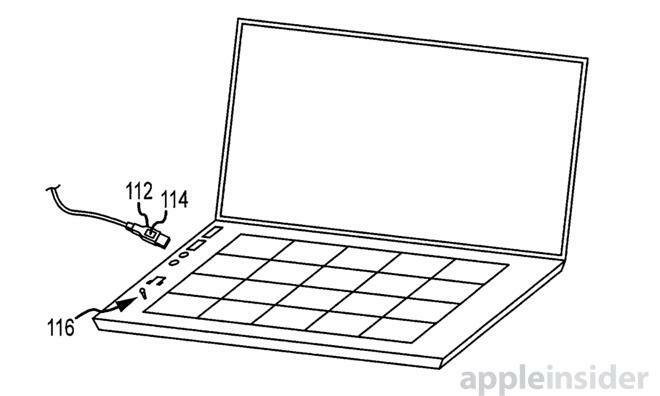 A new patent filing reveals Apple's experimentation with a touch-sensitive MacBook chassis, which would offer the ability to sense a user's touch across a notebook's entire bezel, potentially allowing the company to eliminate physical buttons and allow for a more intuitive computing experience. 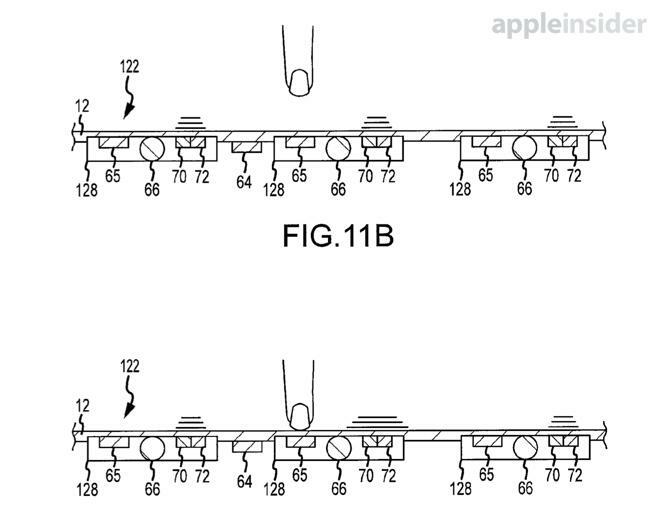 Apple's continued interest in taking touch input and extending it beyond the trackpad was disclosed in a newly awarded patent discovered on Tuesday by AppleInsider. Entitled "Housing as an I/O device," U.S. Patent No. 8,654,524 describes a notebook housing intended not only to hold and protect the parts inside, but also serve as an input/output device, allowing users to control the Mac through touching the chassis. The newly granted patent isn't the first time Apple has shown interest in extending touch controls to a greater surface area on its MacBooks. Just last month, it was awarded a patent for a rear touch input concept for a unique solar-powered MacBook with a two-sided display, while last month the company showed interest in building a trackpad without a traditional "clickable" button, instead providing users with tactile feedback through an actuator, and sensing clicks through four or more force sensors. In the latest granted patent, Apple describes a notebook housing where the external walls would accept user input and react to where they touch the device. In one example, a user could place their fingertip around a MacBook's USB port, the system could automatically display a window with USB-specific options, or simply say the term "USB" aloud to inform a user of the name of the port. Touch controls could even be extended to the exterior of the MacBook display, as the invention notes that a user could invoke video conferencing by placing their finger near the notebook's forward facing FaceTime camera located above the screen. Apple could also use this feature to add button-less controls for functions like volume, allowing a user to tap near the speaker on a MacBook chassis to adjust the volume. Apple's concept describes intuitive controls that are temporarily hidden from view, only lighting up when invoked, but still simple enough for users to figure out without the need for constant visual cues. In addition to touch, Apple notes that squeezing would also be a potential input gesture allowed by a MacBook chassis. The patent describes a user squeezing the device between their fingers in order to adjust the volume level while listening to music. It notes that squeezing the left side of the housing could serve one purpose, such as lowering the volume, while squeezing the right side could have the opposite effect and raise the volume. Apple's advanced MacBook chassis wouldn't just accept input —it'd also be able to provide users with feedback, based on the patent's description. For example, embedded light emitters near control actuators could clue users in as to where they can touch to adjust the volume or activate certain features. If Apple were to take this concept all the way, the company notes the system could be used to provide a "virtual keyboard" without physical keys. These controls could be invisible when not in use, and lights embedded in the MacBook frame could then allow the keyboard to be seen when a user wishes to type. 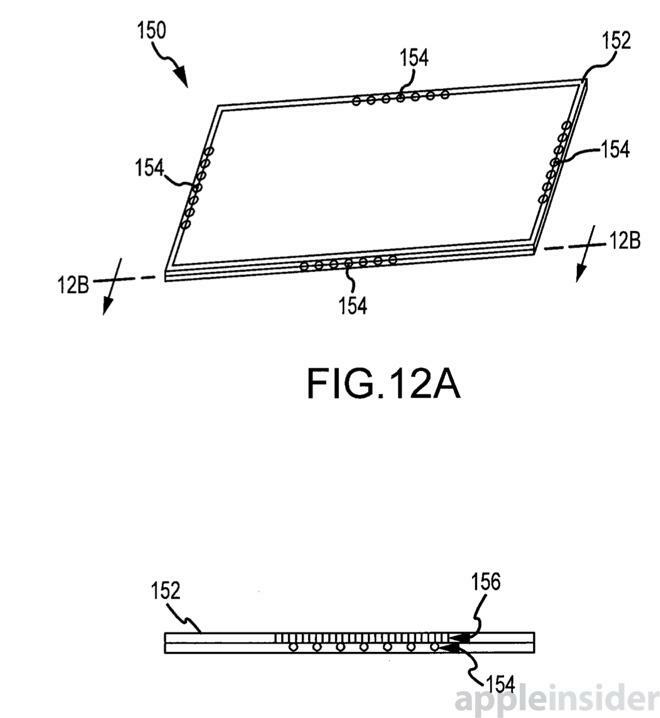 Apple describes a hypothetical notebook in which the base would be a "single continuous housing surface with no or limited breaks." The touch-sensitive surface could then illuminate the virtual keyboard as needed, but remain dark when it is not in use. Graphics within the housing could also provide users with limited information while the MacBook is asleep. For example, a battery life indicator or wireless connectivity status could be displayed through lights integrated in the chassis, even while the computer is idle and the main screen is off. Apple's newly awarded invention was first filed with the U.S. Patent and Trademark Office in 2009. It's credited to Aleksandar Pance, Nicholas Vincent King, Duncan Kerr, and Brett Bilbrey.